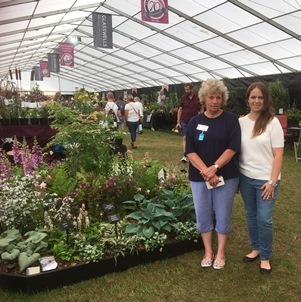 The Nursery was established in 1999 By Proprietor Gill Stitt, is still run as a family business with her daughter Catherine and husband Bill. We were originally located in the grounds of Shrubland Park in Coddenham, Suffolk but moved to Elmsett near Hadleigh in 2011 after the sale of the Park in 2009/10. Despite the change of location we decided to retain the name of Shrubland Park Nurseries on which we have built a reputation for unusual plants. Many know us affectionately as just "Shrublands". We grow a diverse range of hardy perennials, shrubs, climbers, and ferns along with more unusual tender and conservatory plants. Visitors to the nursery can be assured of a friendly and relaxed atmosphere. Whether you're new to gardening or a green-fingered enthusiast we will always be happy to help you with suggestions for any situation in your garden. We offer services such as border planning if you are stuck for ideas, a grow-to-order service if you need larger quantities of plants.